40 fast-moving short-short stories by the creator of Mike Hammer! Before Mike Hammer, P.I. made his explosive debut in I, the Jury, author Mickey Spillane (1918-2006) toiled in relative obscurity, writing short-short stories as filler material in Golden Age comic books. Their purpose to fulfill a postal requirement, these stories were the literary boot-camp for the future king of hardboiled fiction. In commemoration of the year-long Spillane centenary, Bold Venture Press is proud to release the newly revised and expanded edition of Primal Spillane: Early Stories 1941 - 1942. This unique anthology, long out-of-print and largely unavailable, returns with additional material never before reprinted — and a newly discovered, previously unpublished story by Spillane. In this collection, you’ll meet high-flying soldiers, a prospector exploring a Lovecraftian mine-shaft, a light-fingered con artist, an overworked cub reporter, a hapless exterminator, and many others. The combined cost of the rare comic books in which these text pieces first appeared today would be more than that of a new Cadillac; but these short stories provide their own memorable rides. Their value as a training ground for the 20th Century's top crime-fiction writer is priceless when compared to the millions of fans across the world entertained by Mickey Spillane's prose. 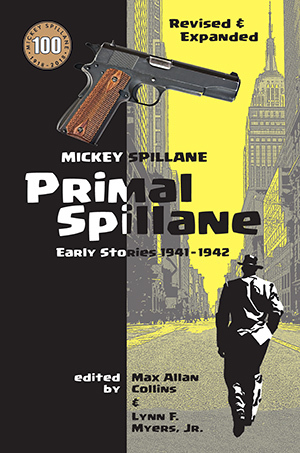 Introduction by Max Allan Collins, America’s top crime-fiction author, and Lynn F. Myers, Jr.
Read more about Primal Spillane in the blog post "Sudden Fiction" — publisher Rich Harvey offers a few insights in the latest installment of "Bold Venture Bulletins." The stories numbered 1-28 appeared in the original Gryphon Books edition (2003). Stories numbered 29-41 are unique to this new edition; #41 "A Turn of the Tide" was previously unpublished and appears for the first time anywhere. Trouble — Come and Get It!